Candidates for Virginia Lieutenant Governor Justin Fairfax (D) and Jill Holtzman (R) discuss issues facing Virginians in the 2017 election. 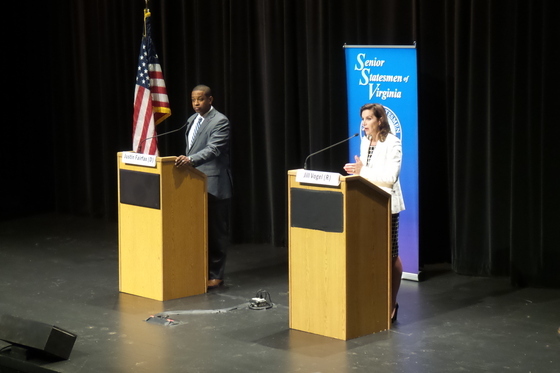 Justin Fairfax (D) (Left) and Jill Holtzman (R) speaking at The V. Earl Dickinson Building. Justin Fairfax (D) was raised by a single mother and her parents. He is a graduate of DeMatha Catholic High School, Duke University and Columbia Law School, where he was a member of the Columbia Law Review. He later served as a federal prosecutor in Virginia. He currently practices with the Tysons Corner office of the law firm Venable LLP where he focuses on white-collar criminal-defense matters and complex civil litigation. Senator Jill Holtzman Vogel (R) is serving her third term in the Virginia Senate. She is a graduate of the College of William & Mary and DePaul University School of Law. She is a senior partner in Holtzman Vogel Josefiak Torchinsky PLLC, a firm that specializes in election and ethics laws. In the Virginia Senate she chairs the Privileges & Elections Committee and is a member of numerous other committees and subcommittees, including the Senate’s “money” (taxation and spending) committee, Senate Finance. The forum was moderated by Bob Gibson. Mr. Gibson is a long-time political writer, columnist and editor at The Charlottesville Daily Progress. He is now with the University of Virginia’s Weldon Cooper Center for Public Service. The candidates spoke at the Wednesday August 9, 2017 meeting of the Senior Statesmen of Virginia. The meeting was held at the V. Earl Dickinson Building and in conjunction with Piedmont Virginia Community College. Following the presentation, questions were taken from the audience.